The Macho Pop provides up to 18 oz. popping capacity in a well priced 15 Amp popcorn machine. 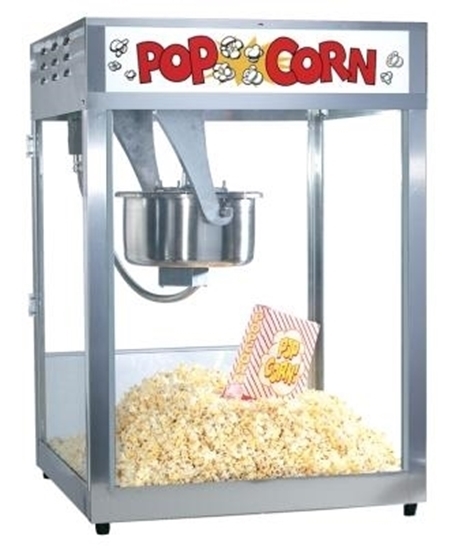 This is the best value in mid size popcorn machines. This is a high performance popper that maximizes production with its unique filter system, creating higher volume and airflow. It features the removable EZ Kleen kettle for easy cleaning, the Big Eye Control that signals the operator when popcorn is ready to dump, warming light, and heated deck to keep corn warm/fresh. Additionaly included is tempered safety glass with plexiglass doors. Popcorn scoop included with popper.